When you start one of the five best pitchers in baseball against one of the five worst teams in the league, you generally expect to win most of the time. When that pitcher fires seven shutout innings, you really expect to win. When Fangraphs gives you a 92.2% chance to win in the ninth inning against that bad team, you absolutely have to win. The Mets did not win. Jacob deGrom was spectacular yet again, but it’s really hard for words to do justice to how good he was, and has been, in 2018. Last night, the Mets’ ace didn’t even have his best stuff, but it didn’t matter; deGrom always finds a way. He worked out of jams in the fourth, fifth and sixth innings, though it’s not like he was giving up contact left and right, either. Much of the contact against him was soft, and one of the jams he dealt with was partially the product of an error in the field by Asdrubal Cabrera. deGrom stuck out eight, walked two and hit Derek Dietrich with a pitch twice. It really wasn’t even that great of a start by his standards, especially when adjusting for the competition, but what makes it so amazing is just the sheer consistency that deGrom has displayed not just this year, but for the better part of four and a half seasons now. He’s the safest quality start maybe in the entire National League right now. He won’t strike out a million in a game like Max Scherzer, but his lows aren’t too low, and while he might not have the headline-grabbing, signature games as often as guys like Scherzer or Clayton Kershaw might, most of his outings range from decent at worst to purely dominant at best. Unfortunately, it’s up to the offense to score him runs to make it stand up, and it’s up to the bullpen to close out his games. Last night, neither happened. The only offense the Mets mustered all night came on a Brandon Nimmo home run in the fifth inning. The team only mustered five other hits all night long, and the only other time they got a runner to second base came in the fourth inning, when Jay Bruce got a hit and then Adrian Gonzalez walked with one out. But they didn’t score in the inning, as Luis Guillorme and deGrom couldn’t get the run home. The Mets have scored five runs just once in the last week. They are 27th in baseball in runs scored. deGrom handed off the 1-0 lead off to the bullpen after seven. 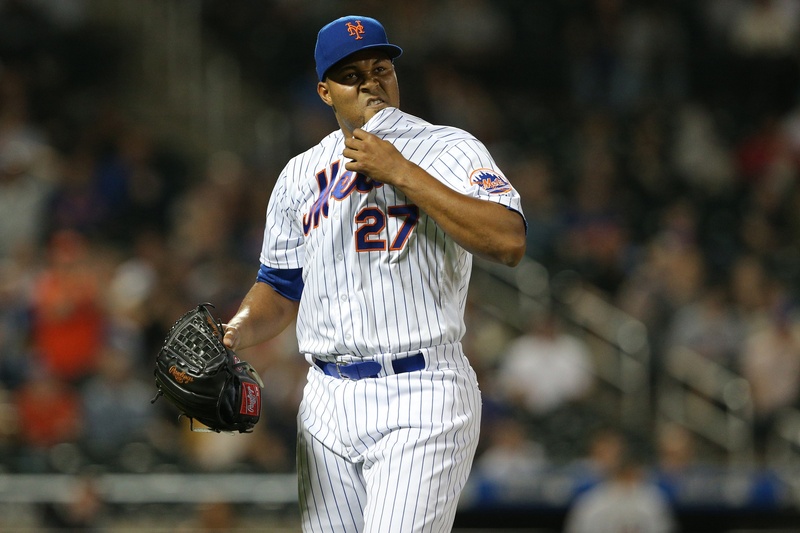 Seth Lugo worked through the eighth, but Jeurys Familia ran into trouble in the ninth. With one out, Martin Prado singled and Derek Dietrich doubled, putting the tying and go-ahead runs into scoring position. Then the next batter, J.T. Realmuto, lofted a ball over second that fell in shallow center, scoring the tying run from third, though Dietrich was cut down at the plate on a perfect throw by Michael Conforto. The game was tied at that point. The Mets intentionally walked Justin Bour to get to Starlin Castro, who promptly laced a base hit into left field to score the go-ahead run from second base anyway. It was Familia’s fourth blown save of the year already. Many people have been getting on Familia — and it was obviously a bad outing — but I’d like to jump to his defense a little bit here. Number one: Saves are a dumb stat. Familia is still rocking a 2.35 ERA, 2.42 FIP and 3.29 xFIP on the year with a strikeout percentage over 30 percent and his best walk rate since 2015. Number two: Of his four blown saves this year, three of them have come in one-run games. A closer is never going to be perfect; every reliever will give up runs sometimes. Familia has been charged with a run in just four of his 23 appearances this season, and three of those four have been blown saves. The onus falls on the offense to build him more of a cushion. For what it’s worth, the other blown save he had (his first of the year) came against the Nationals in April, when he entered the game in the eighth inning with the bases loaded. So I know it really hurts when Familia blows a save, because that’s the nature of blowing a lead in the ninth, but he’s never going to be perfect. The offense is making it extra hard on him, and all of the pitchers, really. Familia gave up those two runs in the ninth, and the Mets couldn’t counter in the ninth. They fell 2-1, and lost the final two games of the series to the Marlins. This was a series they absolutely needed to win, with a tough schedule coming up. The Mets now travel to Milwaukee to play the Brewers tonight, who only have the most wins in the National League. I wasn’t kidding about that tough schedule. Steven Matz takes on Zach Davies at 8:10 p.m. in Miller Park.